It's such a delight to have a kindred spirit in Su, our genealogical doppelganger across the Atlantic. Our shared fascination with the details of living a couple hundred years ago in a tiny berg in Bohemia gives all three of us new insights that we might have missed out on otherwise. We assume YOU share an interest cuz you're here ☺. 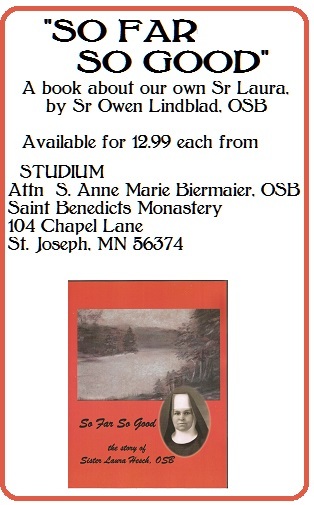 BTW, the "Heimatskunde" is a book written by Josef Binder, our private saint. Herr Schemiceck's "Chronicle of Schamers" was the official account of day to day life in the village. It's written, longhand, in old German. Herman is Su's venerable 1942 German-English dictionary. Sometimes, when tired of wrestling with Google translate, several other translation engines and dear Herman with his minute Fractur print, I idly leaf through Cousin Joe's Heimatskunde, grasping at words I can understand like a drowning man clutches at straws. earnestness that can be both exasperating and endearing. There are some words in the following passages that particularly amuse me but might be different in American English. In vernacular UK English the word for a man or woman employed to put out a fire is Fireman or (in these days of equality) Firefighter. The powerful vehicle that carries a crew of fire-fighters, a tank of water, a pump and a hose, has a bell/klaxon/siren to draw attention to itself and is usually painted bright red and silver is commonly known as a Fire Engine and the place it is stored in (be it very large or only as big as a domestic garage) is a Fire Station. The body that organizes the nation-wide coverage and to which all these things belong is the Fire Brigade or Fire Service. I have no doubt that in these days of political correctness and curiously evasive job titles all these items have different names within the service itself but if you called the emergency services and asked for a fire engine and firemen to come and help you the right sort of thing would (hopefully) arrive. In the time of Josef Binder's Heimatskunde, firefighting was a different beast because all the power needed to work it was generated by men or possibly horses. So a modern fire-engine is ein Feuerwehrauto but the Heimatskunde uses the word Feuerspritze which google insists is a 'fire syringe'! I have a wonderful mental images here of the voluntary firemen bravely dragging forth a huge medical syringe and hypodermic needle then sending it careering through the streets of Schamers to surgically inject water into the flaming building followed by minor explosions, squawking chickens and burning wheels falling off in the best black and white silent movie style. Herman says a better translation would be a Fire Squirt but it is still very amusing and just changes the image to one of a gang of puffing men working the pump for all they are worth and half the water escaping through leaks and holes while a mere trickle comes out of the hose. Today a Fire Station is eine Feuerwehrstation but in the Heimatskunde it is, delightfully, the Spritzehaus and thus the Syringe House or the Squirt House. It really can't get much better. rebuilt after a fire in in 1843 but I did not realize that several other houses had been burned down at the same time. This explains why Nos 39- 43 (excluding No. 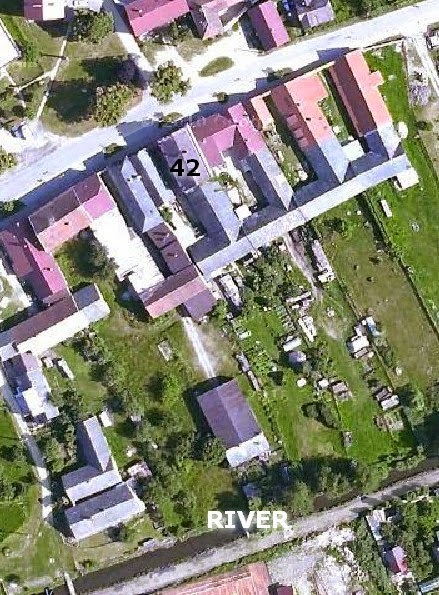 42 which of course was rebuilt again in 1894) all look so similar in size, shape, construction style and alignment. It is even more striking if you look at the aerial view you can see on Google. How terrifying it must have been: the lowing cattle, screaming horses, the panicked grabbing of things most dear when suddenly awoken from sleep. It was winter; did they have time to put on warm clothing over their night clothes, and what a grim time of year to lose everything - I wonder how they all managed. I know the winters can be bad in central Europe; was the stream at the bottom of their gardens frozen so they could not get enough water or was it just so quick that nothing could be done? Schamers ein Schaden[s]feuer aus, bei welchem die Privathäuser Nro. 39, 40, 41, 42, 43 und 45, dann das Rathaus Nro. 45 ein Raub der Flammen wurden. On the eighth February 1843 broke early between 4 and 5 o'clock clock in the markets town of Schamers damaging from fire, at which the private houses Nro. 39, 40, 41, 42, 43 and 45, then the Town Hall Nro. 45 [fell/became]a prey to the flames. Von den niedergebrannten Häsern waren Nro, 41, 42 und 43 bei der Triester Azienda assecuratrice versichert. Of the burnt houses were Nos. 41, 42 and 43 insured with the Triester Azienda assecuratrice. Aus der erhobenen Sachlage ging die Vermutung hervor, dass das Feuer durch das Abholen des Viehfutters aus der Scheuer am Tage des Brandes früh beim unverwahrten Lichte oder brennender Pfeife verursacht worden sei. From the collected facts, the presumption, it appeared that the fire was caused by the collection of animal feed from the barn on the day of the fire in the morning on unexpected/unguarded light or a burning pipe. This was just the most recent of many fires recorded in the Heimatskunde and it must have been an ever present danger with hay, straw, flax, wood and similar materials stored in the barns next to the houses, the dwellings themselves made of flammable materials and the only sources of light and heat an open flame of some sort. Most of the roofs in that area are now made of clay tiles but it is possible that they were once made of wooden shingles, the most likely roofing in a well forested area. 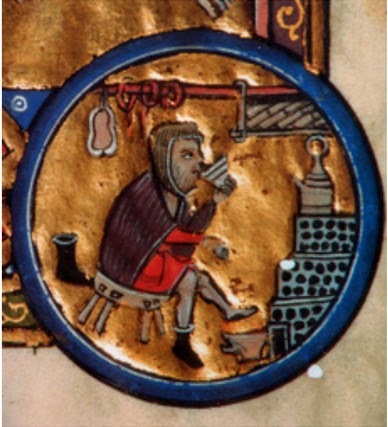 There may not have been open fires in the houses as the Austrian/German kachelofen or ceramic tiled closed stove has been around for a very long time as shown by the illustration from a medieval manuscript. hernach der Backofen angebracht, worauf die Kinder zu schlafen pflegten. This old farmhouse contained a large parlor, where there was still a hanging lamp, beside the peasant's room the vault room, and afterwards, the oven was installed whereupon the children used to sleep. Gegenüber vom eingange ins Wohnhaus, nämlich vom Hofraume aus, war ein Vorhaus und dann kam man in die schwarze Küche, wo auf offenem Herde zur warmen Jahreszeit die Speisen gekocht wurden. vestibule and then you came into the scullery where were on open stoves for the warm season, the food cooked. 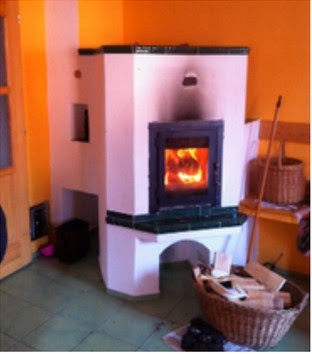 Im winter geschah das Kochen der Speisen in großen Kachelofen bei einer Heizung von der Küche aus. 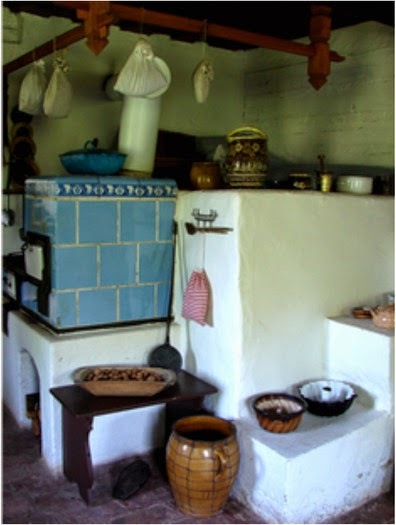 In winter the cooking of the food took place on large tiled stove that heated the kitchen. (Chap. 20 page 350). The newly (2013) renovated No 40 Schamers (also rebuilt after the fire of 1843) has something similar (left) although how close that is to the original in the house I have no idea. was that the basic construction should be massive; either of brick or stone or soil but the outer finish was probably a matter of taste or economics. Plaster would do, but ceramic tiles, so easily wiped clean, would have been a boon to the busy housewife and no double a source of some considerable domestic pride. In 1876, a fire engine to 600 Fl. purchased; the same is by Ferd. Hilgartner been manufactured. 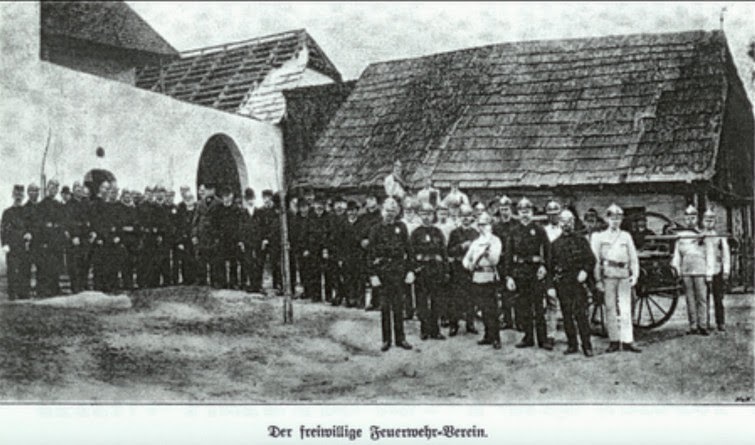 Der freiwillige Feuerwehr-Verein in SchamersDer freiwillige Feuerwehr-Verein wurde im Jahre 1889 gegründet. The Volunteer Fire Department Association was founded in 1889. Fucker Ludwig und Schrift-führer Johann Schimeczek. Chairman was Jacob Longin, chief officer, deputy Ferdinand Binder, Treasurer Ludwig Fucker and font-leader (chief or maybe Fire Fighter] Johann Schimeczek. Im Frühjahre 1890 bekam der Verein die erste neue Saugspritze, welche die Firma "Smekal" aus Prag um den Betrag von 900 fl. lieferte. 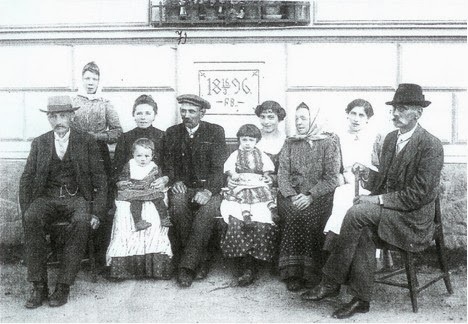 In early 1890, the club got the first new suction pump, supplied by the company of "Smekal" from Prague [see below*] by the amount of 900 florins. In 1895 the club received the second suction pump, which was bought by/from the company Ischermak in Teplitz for the amount of near 900 fl. brigade. This is the Ferdinand BINDER (Granddad Ludwig's godfather and his mother Antonia's cousin) who appears as an old man with two of his brothers in front of No. 42 in the photo you posted on March 4 2014. He had good reason to support a fire service because his parents Anton and Josefa BINDER (also the parents of our St Joe) had been made homeless in the fire on 8th February 1843 when Josefa was 5 months pregnant with their first child. Anton's younger brother Josef, (Rob's great, great Grandfather) as yet unmarried, was also made homeless because he was living at No. 40 with his parents. No doubt Ferdinand and all his siblings and cousins grew up on the stories of the day the house burnt down and were probably taught to be very careful with fire. Note that the building on the right behind the 'fire squirt' appears to be roofed with shingles -the 'tiles' seem to have worn, ragged, lower edges, characteristic of old shingles, in a way that clay tiles do not. to whether the new fire engine was called 'Smekal' because that was its brand name or whether it was just an affectionate nickname, but on googling it I found a wealth of information. There was a Czech firm called Smekal who manufactured fire engines and were active from 1820 to 1940 and a book was written about it by Josef Jendrisak. They made both man and horse-drawn machines, and by 1891 were incorporating steam-powered pumps. Goodness me, you thought we were obsessed but there's a world-wide register of old fire engines still in existence and an entry about the company there. It's hard to tell from the photograph what type of engine the Schamers brigade had but it was quite a wealthy community and I think I can see the top part of a chimney in front of the middle man of the three in pale jackets in the back row and this suggests it was a stem powered pump. I haven't been able to find out anything about Firma Ischermak in Teplitz but the register of old fire engines says there was a company called Czermack in Teplitz and that seems suspiciously similar for me to suspect it could be the same company. Daselbe ist im Jahre 1893 erbaut worden. The same was built in 1893. Es steht an der Stelle jenes Kleinhauses, das man beim Grofe [sic]=Jörgla=Schuister nannte. große Feuersgefahr für die ganze Umgebung. It was built entirely of wood, and since the chimney was fissured the sparks flew in the attic, so this small house was a big fire danger for the whole environment. Darum wurde dieses Kleinhaus von dem Besitzer Johann Thuswald um 300 fl. gekauft und an deiser Stelle das neue Spritzenhaus aufgebaut. Therefore, this small house was purchased from the current owner Johann Thuswald, for 300 fl and the new fire station built. hergestellt, damit die Entfernung bei einem eswaigen Brande gleich weit sei. The construction of this Fire station was deliberately made ​in the middle of the market town, thus the distance is the same in a the event of fires. I have worked out from the above description, Richard Schemiceck's list of houses and occupants and the accompanying map in his Chronicles of Schamers that the new fire station was directly opposite No. 39 so the fire squirt would not have had far to go to fight the fire in which nos 39-45 were consumed had it been around at the time. Even so, there had to be volunteers around to man the engine. The Heimatskunde records a fire that broke out in a house during the day and the wind was so strong that three houses were consumed before the villagers could return from the fields to deal with it. 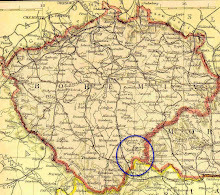 But what of the smaller villages like Niederschlagels/Dolní Lhota , Oberschlagels/Horni Lhota, and Neidermuhl /Dolni Zdar, outlying areas and the isolated farms? Perhaps they too made the best provision they could acording to their means and ability. In England I have seen huge hooks mounted on long poles hung on the walls just under the eaves of old buildings. Their purpose was to claw the burning thatch off the roof to try to contain the fire, the main danger to other houses being bits of flaming thatch borne up by the rising hot air and dropping on roofs nearby, but their weight and unwieldiness would have made them difficult to use even for several strong men. Few pumps or wells could have sustained the constant demand for water and as recounted above strong wind would have made the situation worse. Fire is a danger that is not so well understood by younger people used to central heating but, as my Dad wisely warned me when I was very small; 'fire is a wonderful servant but a terrible master' and we still can't do much about the careless smoker.